VANCOUVER, WA – Optimization has become more and more relevant in today’s market. It just makes sense; not only economically, but environmentally, according to TigerStop LLC. With competition mounting and demand resurfacing, businesses now stand to make a decision: Adopt the new industry standard or be left in the dust. TigerStop has known the importance of this for years, developing optimization machinery and software that exceed industry expectations. Now the firm is announcing a new optimization system at a very attractive price point: the TigerSaw1000. Built in the USA with heavy-duty build and rugged construction, it features numerous design innovations -- from the ease of changing belts to its unique ability to easily square the saw to the tables. A complete list of features is available, and AWFS Fair visitors to Vegas later this month can see the product in action in booth 8920. 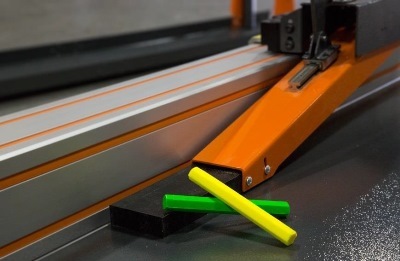 Obtain more information on TigerSaw1000 Crayon Marking Automatic Push Feed Systems. TigerSaw1000 delivers a fully automated and integrated system that works for any level of manufacturing. Each work cell can afford an automated system to provide dead-on cuts with a minimum of labor and materials. For more information, visit www.tigerstop.com or call 360.254.0661. The full-scale international AWFS®Fair, scheduled for Wednesday - Saturday, July 24 - 27, 2013 in Las Vegas, has become a critical hub for international commerce in the woodworking industry. The AWFS®Fair brings together the entire home and commercial furnishings industry, including manufacturers and distributors of machinery, hardware, lumber, construction materials and other suppliers to the furniture, cabinet manufacturers and custom woodworkers.